What, if anything, do all these moments have in common? Separated by decades and borders, they obviously are not all the same. But it is equally obvious that there are some links. All these people were struggling against certain gruesome horrors. They all wanted us to care about the torments of victims, even unfamiliar and distant ones. They invoked a universalistic conception of humanity, making uncomfortable demands on our empathy. They sought to infuse morality into government policy. Some observers today will note larger or smaller continuities, but it is not hard to see in them—and there are more where they came from—something resembling a liberal tradition promoting human rights. But all these stirring snapshots are irrelevant, Samuel Moyn would say. His central argument in The Last Utopia is that the human rights movement is a newfangled and utopian creed, without any real historical antecedents before the mid-1970s. “Over the course of the 1970s,” he writes, “the moral world of Westerners shifted, opening a space for the sort of utopianism that coalesced in an international human rights movement that had never existed before.” Moyn offers a new “alternative history of human rights,” which denies them any pedigree before our time. The universalism in Greek philosophy? “Of no real relevance.” The Enlightenment’s rights of man, enunciated in the American Declaration of Independence and the French Declaration of the Rights of Man and Citizen? “Strikingly distinct from contemporary human rights.” The Declaration of Independence? “Not really about rights.” Citizen campaigns for rights for women, workers, Jews, blacks, and immigrants? “More obfuscating than illuminating.” The shocked aftermath of World War II, and the Universal Declaration of Human Rights? “A funeral wreath laid on the grave of wartime hopes.” Anti-colonialist appeals to human rights? “A wholly different conception.” And so on. Historians of human rights approach their subject, in spite of its novelty, the way church historians once approached theirs. They regard the basic cause—much as the church historian treated the Christian religion—as a saving truth, discovered rather than made in history. If a historical phenomenon can be made to seem like an anticipation of human rights, it is interpreted as leading to them in much the way church history famously treated Judaism for so long.... Meanwhile, the heroes who are viewed as advancing human rights in the world—much like the church historian’s apostles and saints—are generally treated with uncritical wonderment. Hagiography, for the sake of moral imitation of those who chase the flame, becomes the main genre. And the organizations that finally appear to institutionalize human rights are treated like the early church: a fledgling, but hopefully universal, community of believers struggling for good in a vale of tears. If the cause fails, it is because of evil; if it succeeds, it is not by accident but because the cause is just. These approaches provide the myths that the new movement wants or needs. Moyn is intelligent and erudite, and he has put a great deal of effort into his revisionism. But the results are sufficiently unconvincing that, in the end, his book winds up more as a reminder of how solid and subtle the preceding histories of human rights actually are. It turns out that there is still a longer historical view for understanding human rights. What “church history” exactly? Many of the books that Moyn dislikes are actually full of nuances and defeats, replete with hypocrisy and human frailty, but without a sense of the inevitable and over-determined victory of saints. Some of this complexity comes from the authors’ archival research, reporting, and travel around the world. (Moyn barely touched any archives, looking only at the papers of some American Jewish activists.) Adam Hochschild, for instance, in Bury the Chains: Prophets and Rebels in the Fight to Free an Empire’s Slaves, a gripping book on the British fight against slavery and the slave trade (whose title Moyn gets wrong), sees nothing inevitable about the victory of abolitionists: “Their story is not a simple one, but a ragged and untidy epic that did not unfold in the orderly way they hoped for.” It is true that Hochschild does not hide his satisfaction that slavery was halted, but that seems perfectly appropriate. Moyn also blasts Mary Ann Glendon’s A World Made New: Eleanor Roosevelt and the Universal Declaration of Human Rights, a splendid history of the origins of the Universal Declaration in 1948, as a typical “story of breakthrough, triumph, and uplift that screens out the most interesting features of the period.” Instead, Moyn argues that great power diplomacy was more important than human rights in the early years of the United Nations. But the reality is that Glendon got there first: she takes it as a general rule of politics that power trumps conscience, argues from the start that the “human rights project was peripheral” to big power diplomacy in creating the U.N., and refers often to Cold War tensions. About Samantha Power’s “A Problem from Hell”: America and the Age of Genocide, Moyn declares that it “fails to reflect on the very recent conditions for the possibility of its own moral position and energy.” Power’s magnificent book, based on scholarship and personal experience covering the slaughter in Bosnia, is an almost entirely maudlin tale. From Wilson to Clinton, president after president systematically lets genocide go on—including Jimmy Carter in Moyn’s golden 1970s, who had Cambodia on his watch. True, there are some lonely “upstanders” calling out for action against genocide, but they are almost invariably defeated and humiliated. If this is “church history,” they would be weeping in the pews. Moyn’s book omits a great deal. Cesare Beccaria’s famous fight against torture is not here. Neither is the mobilization against the Armenian genocide. He breezes past the interwar minorities treaties. Not once does he mention Nelson Mandela, who invoked the Universal Declaration of Human Rights in his famous Rivonia trial speech in 1964. Most remarkably, even as Moyn decries “deeply selective history,” his book ignores two really colossal chunks of pertinent history: the anti-slavery movement and the development of the laws of war. It is a commonplace that the human rights movement hearkens back to the anti-slavery campaigners, both for their expansive empathy and their organizational innovations. David Brion Davis, the great historian of the subject, called it “the world’s first successful if costly movement for human rights.” In part due to pressure from this activism, Britain—which had dragged more than three million innocent Africans across the Atlantic—ended the slave trade in 1807, and then in 1833 abolished slavery in its colonies. France and Denmark passed emancipation laws in 1848; Alexander II freed Russia’s serfs in 1861; America’s bloody Civil War led to the end of slavery for four million African Americans; Cuba abolished slavery in 1886, and Brazil did likewise in 1888. The movement rested on empathy with suffering and dying slaves who were far away, culturally unfamiliar, and had dark skin in an era of ferocious racism. Davis remarked that “the British had always represented the abolition of slavery and especially the suppression of the slave trade as objectives of universal value to humanity, transcending the interests of any religion, class, or nation.” That is institutionalized today in the Universal Declaration of Human Rights, which bans slavery and the slave trade. No doubt, there are productive debates about how much the anti-slavery campaigners had to do with human rights today, and how much their mobilization resembles more recent activism. But Moyn does not bother with any of this: he dismisses in two sentences this extraordinary story of human emancipation. Moyn’s other huge omission is the laws and customs of war. States are at their most lethal at war, and least likely to respect the legal claims of other humans. That is why restraints on wartime governments are so important and so fascinating. The concept of “crimes against humanity” reveals a universalistic impulse in international law. And yet Moyn writes of the Geneva Conventions only once, and of Hague law not at all. Nor does he discuss the Tokyo War Crimes Tribunal or the Eichmann trial. He only glancingly mentions Nuremberg. Nuremberg is a striking case of how rights talk made a real difference. At first, Franklin Delano Roosevelt’s administration planned to shoot the top Nazis without trial, which would have been wildly popular with the American public. But Henry Stimson, a Republican lawyer serving uneasily as secretary of war, demanded real trials. No danger of hagiography here: Stimson interned Japanese Americans, failed to take steps to stop the Holocaust, and unleashed fiery devastation on Japanese civilians in city after city. Still, here he had a view of rights that did not apply only to Americans. He thought that a successful relationship with Stalin would rely on a Soviet implementation of “a constitution with a bill of rights like our own.” Stimson wrote to Roosevelt that the German leaders must get a trial with due process: “Such procedure must embody, in my judgment, at least the rudimentary aspects of the Bill of Rights.” After fierce Washington infighting, Stimson won out. He did not much care about the Holocaust, but Robert H. Jackson, the Supreme Court justice who led the American prosecution, wrote of “this program of extermination of Jews and destruction of the rights of minorities” as part of the Nazi plan for aggression. And yet somehow Moyn offers an entire chapter on international law that leaves out Nuremberg. Of course, human rights did not spring fully formed from the ground. Moyn, an intellectual historian, concentrates on ideas. But the actual story of human rights has been driven at least as much by real-world politics and economics—notably, by the rising and falling strength of liberal democracies. In an important book that Moyn never mentions, Samuel P. Huntington identified three sweeping waves of democratization across the world. Democracy and individual freedoms at home are not the same thing, but Huntington argued they go extremely closely together. Huntington’s overview was systematic and global, where Moyn’s is impressionistic; and it paints a very different picture of how freedom spread. 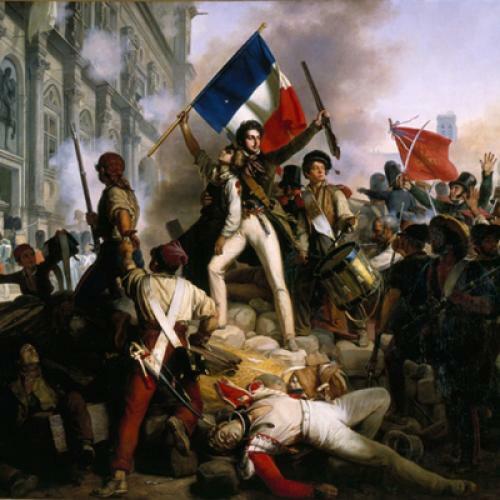 The first wave of democratization, long and slow, was rooted in the American and French Revolutions, with liberal ideals and institutions spreading to Switzerland, Italy, and Argentina. After World War I, successor states to the Russian, Austro-Hungarian, and German empires followed suit. But from 1922 until 1942, especially during the Great Depression, the tide turned: democracy withered in Spain, Poland, Greece, the Baltics, Portugal, Brazil, Argentina, Italy, and Germany. Nazi Germany killed freedom and democracy in Czechoslovakia. This wave ran out by the early 1960s, with democratic governments in Latin America and Asia collapsing: coups in Brazil and Argentina, authoritarianism in South Korea. Then in 1974, Huntington argued, a third wave of democratization started, surging throughout the 1980s and 1990s: first Portugal, then Greece and Spain; next much of Latin America, from Ecuador to Argentina; the end of emergency rule in India and a return to democracy in South Korea; in 1989, the great liberal revolutions in eastern and central Europe; and in 1994, liberal democracy in South Africa. This is hardly an uplifting tale of historical inevitability, as the many reversals make clear. Some argue that we are living through another such reversal today. Still, despite Moyn’s complaints about selective history, that is what the bulk of his own project is: an attempt to downplay the first and second waves of liberalization, while lionizing the early years of the third wave. While he is trying to burst bubbles in the froth, he fails to notice the swells beneath. When human rights currents cannot be ignored, Moyn tends to define them away. His book often exaggerates today’s human rights politics, and then denies a linkage between it and prior history. Rights talk has changed over the years, of course. Despite their commonalities, there are proper distinctions to be made between humanitarianism, natural rights, civil rights, legal rights, social rights, and human rights. Richard Tuck, in an excellent study of the notion of natural rights going back to the 1350s, finds that many of the early rights theorists could be quite authoritarian, except Grotius. Some natural rights theorists excluded women, blacks, and others from the group of people who naturally possess rights. It would indeed be naïve to draw a straight line from 1789 to 1989. Moyn cannot deny “the meteoric rise of the notion of the ‘rights of man’ across the second half of the eighteenth century,” and he admits that “the conceptual foundation of rights even before the Universal Declaration may have been natural or even ‘human’ for some thinkers, especially at the high tide of Enlightenment rationalism.” But still he insists that the eighteenth century’s droits de l’homme or natural rights do not count as antecedents: “It is now the order of the day to transcend that state forum for rights, but until recently the state was their essential crucible.” He levels much the same charge at human rights claims after World War II. Since slavery was a global evil relying on trade, its suppression had to be an international effort. David Brion Davis noted that “antislavery had acquired a supranational character during the late Enlightenment and the early years of the French Revolution.” Today, of course, there is more international machinery for human rights than in 1776. But even in the present era of globalization, and even for groups that work across borders, the focus is mostly on conditions inside of states. Human Rights Watch recently issued a major report, for example, on police corruption in Nigeria, with relentlessly local recommendations: limiting the inspector general’s term to a single five-year span, conducting regular public hearings in the upper and lower houses of the national assembly. The group does make pleas to international organizations, and it runs campaigns on transnational issues like arms trafficking and terrorism, but its overall emphasis is domestic: Malaysia’s ratification of a treaty on disability rights, an assault on a South Ossetian activist, three Angolan human rights defenders convicted under a harsh state security law. The bulk of human rights activism today goes on within national borders, carried out not by cosmopolitans but by citizens struggling for their own rights in their own home countries. On the ground, national human rights defenders are shrewdly aware that repressive governments will accuse them of being foreign stooges. The activists advocate their cause in local idioms. Human rights lawyers know that local enforcement is, with a few exceptions (especially in Europe), the only kind that counts. As Glendon notes, the potency of the tenets of the Universal Declaration of Human Rights has come “mainly through their incorporation into national legal systems.” Even the International Criminal Court prefers to have national courts prosecute war crimes and crimes against humanity. I have seen Colombian activists in Bogotá criticizing top Colombian government officials for complicity with the right-wing paramilitaries; Serbian human rights activists in Belgrade pressing for accountability for Slobodan Milošević’s wars; and Zimbabwean lawyers in Harare relating with extraordinary precision the ways in which Robert Mugabe has failed to live up to the human rights commitments in his power-sharing deal with the opposition Movement for Democratic Change. These were not deracinated internationalists. Moyn’s argument has a rougher time of it after World War II. His narrative, tightly focused on public discourse soon after the war, overlooks the most salient point: that the defeat of fascism permitted liberalism and democracy to flourish. Japan’s new American-imposed constitution carried extensive provisions defending “the fundamental human rights,” including—in about as clear a sign of Enlightenment lineage as one could imagine—the “right to life, liberty, and the pursuit of happiness.” But Moyn barely mentions the extraordinary postwar transformation of West Germany, Japan, and Italy into liberal democracies in which human rights could thrive, nor the impressive growth of a zone of European protection of human rights. Instead he downplays the invocations of human rights by Roosevelt during the war, and in the U.N. Charter and the Universal Declaration of Human Rights; regional human rights instruments such as the European Convention on Human Rights and, in Latin America, the American Declaration of the Rights and Duties of Man adopted in Bogotá in 1948; U.N. campaigns against human trafficking and forced labor, and U.N. efforts at refugee relief; the American civil rights movement; and the Convention on Genocide. He tries to divorce anti-colonialism from human rights, although after independence, the new constitutions of Burundi, Cameroon, Chad, Congo, Dahomey (now Benin), Equatorial Guinea, Gabon, Guinea, Ivory Coast, Madagascar, Mali, Mauritania, Niger, Rwanda, Senegal, Somalia, Togo, and Upper Volta (now Burkina Faso) all included specific references to the Universal Declaration of Human Rights. After a while, even the most generous reader is going to wonder why, if human rights were so irrelevant until the mid-1970s, Moyn has quite so many targets that he needs to try to knock down. Moyn declares that human rights became an important part of international law “only yesterday.” But his account leaves out much. In a 1918 edition of a treatise first published in 1890, Pasquale Fiore, a leading Italian authority on public international law, wrote that “the international rights of man must be considered to be under the collective legal protection of all civilized states.” European and American legal authorities such as Fiore, Edwin Borchard, and Hersch Lauterpacht have long argued for the legality of humanitarian intervention. Moyn, trying to minimize the importance of memories of the Holocaust in forging human rights, overlooks a shattering personal story: Lauterpacht, the great British international lawyer and author of the influential treatise International Law and Human Rights, which appeared in 1950, lost almost his entire family—including his parents and brother and sister—in the Holocaust, and then worked with steely professionalism for the British prosecution at Nuremberg. But then the miraculous mid-1970s arrive, and Moyn reverses course. Previously so stingy in acknowledging human rights currents, he now sees them everywhere. To paraphrase Larkin: human rights began in 1973 (which was rather late for me). And relieved of the burden of disallowing previous appearances of human rights, Moyn’s book becomes more relaxed and readable—a hint of the much better book that Moyn could have written if he had not set himself such an implausible thesis. He notes human rights activism from the Soviet Union to Chile. He offers insightful sketches of Havel and other eastern and central European dissidents. Dropping his prior unwillingness to view human rights empathy a bit more broadly, he grants that Bernard-Henri Lévy’s humanitarian activism against hunger stemmed from a human rights impulse. He even does a little hagiography of his own, doting on Moses Moskowitz, secretary general of the Consultative Council of Jewish Organizations. Rather than weighing political or economic causes, or developments such as the mass media or globalization, Moyn claims that human rights emerged “in the 1970s seemingly from nowhere” as a new utopian ideology to replace certain exhausted utopianisms. This seems all but unprovable, and while Moyn does not make his case, it is not clear how anyone could. How does one measure “cultural prestige”? And why did other utopianisms expire in the mid-1970s rather than any other years? Moyn writes that Carter’s inaugural address in 1977 “put ‘human rights’ in front of the viewing public for the first time in American history”—overlooking Kennedy’s defense of “human rights” at home and abroad in 1961, and Eisenhower’s vindication of “man’s inalienable rights” in 1953, and Truman’s denunciation of “brutal attacks on the rights of man” in 1949. Here is a better way to think about it. When he reaches the 1970s, Moyn is catching up with what political scientists, since Huntington, have known as the third wave of democratization. This is the element of truth in Moyn’s contrarianism. But Huntington gave specific political, economic, and international reasons for this wave, along with the non-material factor of the spread of democratic ideals. The economic growth of the 1960s had built up urban middle classes demanding more freedom. The oil shocks and the economic miseries of the 1970s brought shaky and inept dictatorships to their knees. America, Europe, and the Catholic Church promoted democracy, while Gorbachev’s Soviet Union stopped strangling it. (Moyn oddly treats democracy promotion as an “independently developed program” irrelevant to human rights.) And success in one country demonstrated to others how to follow a path to freedom. This is what a more rigorous, worldly explanation looks like. When Moyn writes that human rights are an emotional “mass utopianism,” it does not sound like much of a compliment. “Born in the assertion of the ‘power of the powerless,’” he remarks, “human rights inevitably became bound up with the power of the powerful.” This poses a final puzzlement. Human rights may be many things, but they are no utopia. Quite the contrary. The human rights movement has been driven not so much by the search for non-existent utopias as by actual collisions with existing dystopias: slavery, torture, genocide, war crimes. Judith Shklar, another figure whom Moyn scants, offered a wiser understanding—and one more typical of human rights activists. Horrified by the twentieth-century nightmare of totalitarianism and total war, she proposed “the liberalism of fear.” Instead of searching for the highest good in life (as Moyn says utopian human rights activists must), her liberalism seeks to avoid the worst evil: cruelty, the intentional inflicting of pain on the weak to attain some goal. This is a global standard only in the grim sense that “the fear of systematic cruelty is so universal”: everyone dreads the knock on the door in the dead of night. It leads to a tragic view of political life, full of skepticism and misanthropy. Shklar, herself a Latvian Jewish refugee in World War II, grounded this “entirely non-utopian” liberalism in bitter historical experience. Wanting to protect the individual victim from cruelty, she saw liberalism as a rare and tenuous thing. She offered a suitably minimalist foundation for “a strong defense of equal rights” in a terrifying age—nothing that answers to Moyn’s accusation of utopianism. Gary J. Bass, a professor of politics and international affairs at Princeton University, is the author of Freedom’s Battle: The Origins of Humanitarian Intervention (Knopf). This article ran in the November 11, 2010, issue of the magazine.